Madsu is spending the winter under wraps on a trailer next to my house, so I have to satisfy myself cruising the waterfront looking at passing boats. 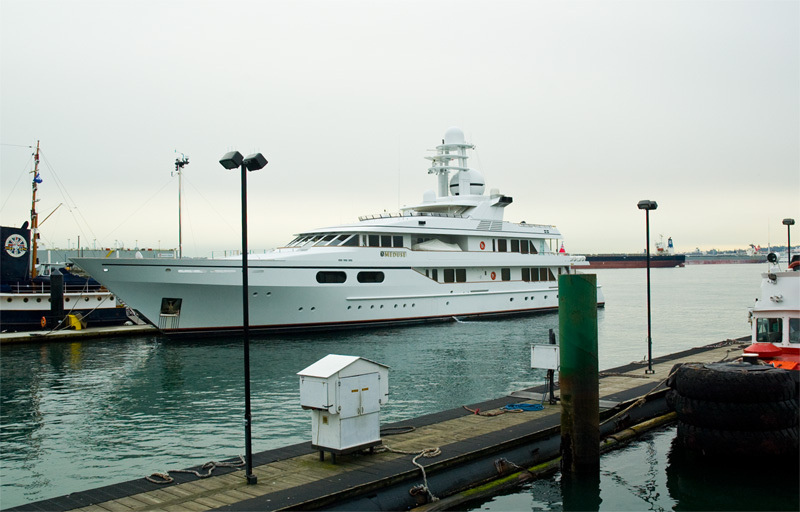 Meduse used to be owned by Paul Allen – though I don’t know whether that’s still the case. She’s looking pretty parked here at Lonsdale Quay in North Vancouver – maybe here for the Olympics ? If she is here for the Olympics, it was brilliant strategy to pick North Vancouver instead of Coal Harbour or False Creek. Already on the North Shore, there are no bridges to cross to get to Cypress Mountain or Whistler for ski and snowboard events. And just steps from the seabus to downtown Vancouver. Smart. 02 Feb This entry was written by bigsnit, posted on February 2, 2010 at 10:54 pm, filed under On The Water and tagged Meduse, North Vancouver. Bookmark the permalink. Follow any comments here with the RSS feed for this post. Post a comment or leave a trackback: Trackback URL. Tucked in and ready to go. Fifteen minutes on the freeway and Madsu will be at her winter home beside our house.